The deva who was currently attacking Bai Xiaochun was someone from the elder generation of Chen Xiong’s clan. He was one of the ten heavenly dukes of Arch-Emperor City… Chen Haosong! All ten heavenly dukes were in the Deva Realm, and none of them were ordinary devas…. they were all in the great circle! Those ten dukes formed a critical reserve power for Arch-Emperor City, something vastly more powerful than Giant Ghost City’s three patriarchs and Duke Deathcrier. Not even Mistress Red-Dust was a match for them in terms of cultivation base. Of course, Mistress Red-Dust was the Giant Ghost King’s daughter, which gave her quite a bit of extra confidence. Furthermore, she also had gifts given to her by her father, including… a precious treasure that could power her up to the level of the great circle of the Deva Realm! However, that precious treasure could only put her in a position to tangle with other cultivators in the great circle. She could not transfer that power to someone else for defensive purposes. Therefore… the fact that Chen Haosong had already unleashed his attack meant that Mistress Red-Dust had no choice other than to try to simply block it. As for Chen Haosong, his expression flickered into a slight frown. He had owed Mistress Red-Dust a favor before, but had already settled that account. However, despite the fact that she had come here to protect Bai Hao, he knew that she likely was not doing it of her own will, but rather, on the orders of the Giant Ghost King. “I wonder,” he thought. “Will the Giant Ghost King really show up in person because of one person getting killed?” Although this was his first time actually seeing Bai Hao in person, he had long since come to loathe him. After all, the matter of the debt of 800,000,000 portions of soul medicine was something that rankled him deeply. Ignoring Mistress Red-Dust, he not only didn’t pull back his finger, but instead stabbed it toward Bai Xiaochun with more speed than before. Instantly, Bai Xiaochun’s mind began to reel. Earlier, before Chen Haosong had made his move, Bai Xiaochun had sensed that he was at least a bit more powerful than the older deva. But now, his attack caused his face to fall. As far as he could tell, this was the most powerful deva he had ever encountered. Although the wave of his finger didn't seem to be drawing upon the will of the heavens, Bai Xiaochun was sure… that he would be completely incapable of avoiding the blow! It was as if… the heavens were conforming to this deva’s will! And that was exactly what was happening! Deva Shapes Heavenly Will! This was the ultimate level within the Deva Realm! There was no time for Bai Xiaochun to ponder the situation, nor did he have attention to spare for the nine heavenly marquises. He could only concentrate on that monumentally shocking finger attack. To him, all creation consisted of nothing but that finger, and as it descended upon him with the power to destroy heaven and earth, he felt as if even his soul were about to shatter. In that moment of deadly crisis, he let out a hoarse shout; he knew that if he didn’t manage to fight back against this finger… he would be killed beyond the shadow of a doubt! Without the slightest hesitation, he pulled out the black spear the Giant Ghost King had given him, the one with the sixteenfold spirit enhancement. Then, he threw it with all his might, sending it like a black bolt of lightning toward Chen Haosong’s finger attack! However, there was more. Backing up, he pulled out the Eternal Parasol with one hand and grabbed Zhou Hong with the other. Although all of these things take some time to describe, they happened within the blink of an eye. In almost the exact same instant that he grabbed Zhou Hong, a massive, ear-splitting boom echoed out. That was the result of the black spear making contact with Chen Haosong’s finger attack. That black spear was a precious treasure that not even an ordinary deva would be able to destroy. Unfortunately, Chen Haosong was in the great circle of the Deva Realm, and attacked with power that far surpassed regular devas. Therefore, the spear shattered into countless fragments, and as for the finger, although it wasn’t destroyed, it was weakened significantly. After the spear shattered, the weakened finger attack continued onward and then slammed into the Eternal Parasol. Intense rumbling sounds filled the air as the Eternal Parasol’s defensive powers held for a brief moment. But then the parasol’s canopy began to rip into pieces. The enigmatically smiling ghost face that the powers of the mask had kept concealed let out a shriek as it ripped itself off of the crumbling canopy and bit down onto the finger, almost like a snake. After that, the ghost face shattered, and the parasol’s canopy was destroyed. Thankfully, the shaft of the parasol was constructed from some unknowable material that survived. Mourning the state of the Eternal Parasol, Bai Xiaochun put it away, simultaneously borrowing the force of the blow to shoot backward. The finger strike had been weakened twice in a row, and now it had almost completely faded away. Meanwhile, Zhou Hong let out a terrified shriek as Bai Xiaochun threw him out in front of him. “I refuse to believe that you would dare to kill the son of a demigod! !” Bai Xiaochun roared. Even as his words continued to echo out, he pulled out another Heavencleaving Good Fortune Pill. When Chen Haosong saw that Bai Xiaochun was using Zhou Hong as a shield, an unsightly expression appeared on his face. Eyes flashing like lightning, he cut off his connection to the finger attack, causing the image of the finger to fade significantly before reaching Zhou Hong. 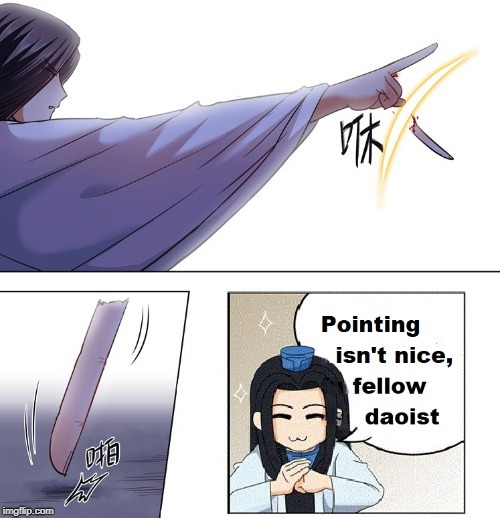 And yet, for some unknowable reason, the finger actually passed directly through Zhou Hong, not harming him in the least… to appear directly in front of Bai Xiaochun! The finger attack struck after all! In that same instant, Bai Xiaochun popped the Heavencleaving Good Fortune Pill into his mouth, and then used his left hand to launch a fist strike at the incoming finger! A deafening boom filled the air. Cracking sounds rang out from Bai Xiaochun, and blood sprayed out of his mouth as he fell back. However, as he did, the power of the Heavencleaving Good Fortune Pill erupted out, healing his wounds even as they appeared. 300 meters back, he finally ground to a halt, where he looked up, ashen faced and panting… but completely recovered from all wounds!! Despite the fact that he seemed to be in good condition, his mind was anything but calm. As of this point, he realized that his understanding of devas had always been incomplete. There was obviously a massive difference between devas of certain levels. “This Chen Haosong… must be in the true great circle of the Deva Realm! That attack of his just now felt like it contained the weight of all the heavens. How terrifying!” As he looked up at Chen Haosong, his heart pounded with a very uneasy feeling. “Like to bully your inferiors, huh?” he thought. “You just wait until I'm a demigod. Then you’ll be my inferior, and I’ll bully you!” Meanwhile, Zhou Hong was trembling in terror at having just stared death in the face. When he saw that deva-level finger attack heading toward him, he was sure that he was going to be killed. The fear still lingered inside of him, and at the same time, he felt more terrified of Bai Xiaochun than ever. As far as he was concerned, he was nothing less than a crazy daredevil!! It was at this point that a red blur of light shot toward Bai Xiaochun from off in the distance, and then Mistress Red-Dust appeared in front of him. She had only been able to watch from a distance as he faced that finger strike alone, and it had left her feeling quite shaken. As of that point she realized… that she didn’t know much at all about this Bai Hao. Silence reigned. The string of shocking methods Bai Xiaochun had used to neutralize the attack of a heavenly duke left the nine heavenly marquises completely flabbergasted. Although each move he had used seemed ordinary in nature, the fact that he had seemingly instinctually called upon them was something that most ordinary people were incapable of. It required not only resourcefulness, but very quick thinking! Furthermore, it was clear evidence of extensive experience in battle. The fact of the matter was that Bai Xiaochun’s display of fighting instinct… was completely shocking to everyone present.